We headed to Six Flags America for some end of the summer fun this past weekend with our tot and our teenager. Six Flags America is located in Upper Marlboro, Maryland, which is only about a 45 minute drive for us. This is one of the few amusement parks in our area and has not only a large assortment of rides for various ages, but also a large water park. We arrived right about 10:30 when the park opened. Daily parking is $20, a bit more if you choose Preferred Parking. Since it wasn't very crowded, we found a pretty close space in the regular lot and didn't have to walk far. We had already printed our tickets, so getting through the turnstiles and bag check went pretty quickly. 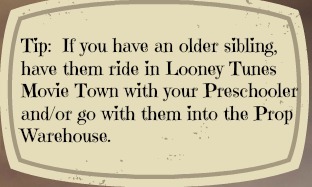 When you enter the park, you'll probably meet some of the characters from Looney Tunes Movie Town. We got some Tweety love before the characters started to walk to other places. There are Character Meet and Greets throughout the park. Since it was somewhere in the 80's, our main focus was going to Hurricane Harbor to stay cool. While my son was spending time at Castaway Creek on the lazy river, we headed to Buccaneer Beach. It is perfect for little ones to splash and play with various little slides and water features. I was very impressed with the number of lifeguards and how they each scanned their area (watch them bob their heads from side to side, you'll be able to tell). They also offer life-vests for little ones (the pool water was about up to my knees; I'm 5'4") and have a First Aid Station close by. 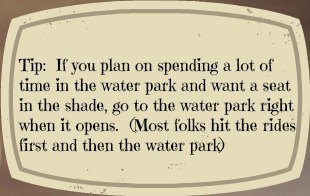 Since it was The Attic Baby's first time at a water park, I wasn't sure what to expect. She loved exploring the little fountain sprays and meeting new friends. She even went down some of the smaller slides by herself. Then she walked a bit through Hurricane Bay with her daddy in the shallow end. She was fascinated with the waves! One of the highlights was seeing Bugs Bunny dancing in the water park. Bugs has some moves! We were getting hungry for lunch, so we changed out of swimsuits in the restroom/shower area and threw our wet stuff into our mesh bag. While we packed a lunch for the rest of the family to picnic in the parking lot, I bought a six inch sub at Subway (unfortunately I can't eat PBJ sandwiches with my low-fat diet). We also bought one of the large Souvenir cups for $15 that gives you free refills throughout the day (they give you a wristband). After our lunch settled a bit, we headed over to the rides. There are lots to choose from for various ages. No one in my family is really into roller coasters, but they have some crazy thrill rides like the Jokester's Jinx and Superman Ride of Steel. You can hear the screams of thrill seekers as they plunge. While my teen enjoyed rides like the Scrambler, we set off to find some rides to keep our 2- almost-3 year old entertained. Looney Tunes Movie Town is full of kiddie rides like the carousel, tea cups, kid-sized coaster & other fun attractions. The Attic Baby was too short to ride most of the ones in this area by herself and adults were not allowed on many of them (many say no one over 54" in height). So we played in a few of the little houses and the Looney Tunes Prop Warehouse where you can soft foam balls out of tubes, chutes, and cannons (they have changed the rules in the Prop Warehouse and only allow parents on the lower level, which is unfortunate because you can't follow your little one around the upper level). 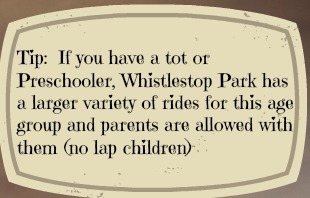 We then headed over to Whistlestop Park at the advice of an attendant who said there were rides there geared toward The Attic Baby's age group. We rode the smaller Whistlestop kiddie train several times since there wasn't a line (they have a stroller parking area). The Whirlybirds were a definite favorite; she loved steering while her daddy made the helicopter go up and down. I was surprised that she loved the small ferris wheel balloons at Up Up and Away. (ferris wheels have never been my favorite) There was also a large playground area with little water fountains and slides. But at this point, it was hot and little miss started falling asleep in her stroller. So we headed out and called it a day. While it can be a bit pricey for a family of four to go to Six Flags America for the day, it is definitely well worth finding discounts or investing in a Season Pass if you live close by. 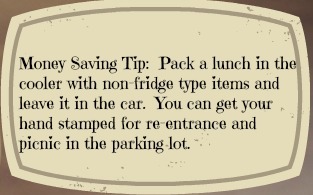 You can also save by packing your own lunch and purchasing value cups. There are so many great rides, shows, special events and the water park features are perfect for cooling off on a hot day. It's a wonderful way to spend time as a family! Visit http://www.sixflags.com/america to find out more about ticket prices and deals on Season Passes and upcoming events like Fright Fest. Do you have any special tips for visiting amusement parks with little ones? Disclosure: As a US Family Guide blogger, I received complimentary tickets for my family. No other compensation was received and all opinions are my own.